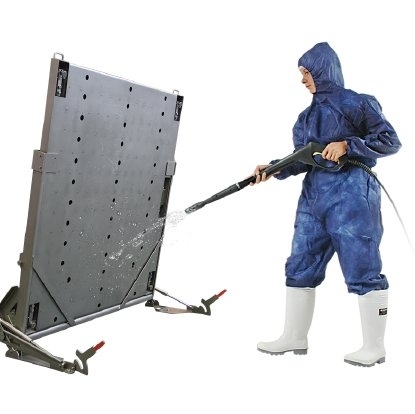 With a high quality, fully stainless steel construction and IP69K rated loadcells, this Lift-Up Drive-In platform scale complies to GMP and HACCP production standards making it ideal for harsh, wet and sanitary environments where hygienic cleaning is vital. The OIML approved LUDI platform scale has a premium quality and robust build that makes it ideal for Pharma, food production and cosmetic industries. 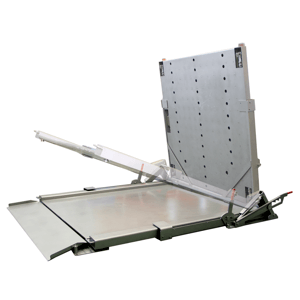 It is available in dimensions ranging from 850mm to 1500mm and in capacities from 300kg to 3000kg. A specially designed lifting device supported by a hydraulic cylinder enables a safe and easy 90 degree lift. Once lifted the operator has clear 360 degree access for the deep cleaning required to eliminate hygiene and contamination risks.